I am kin to the Montgomery family via Margaret Harvis and Sir John Wilson. The founder of the Ulster-Scots lived at Rosemount. The ruined abbey is on the outskirts of Greyabbey village, at the entrance to Rosemount Estate. The Rosemount Estate was granted by Sir Hugh Montgomery to his son James in 1629 and has been in the hands of the Montgomery family ever since. James, who was killed by pirates in 1652, completed the first house on the site in 1634. This was burned down in 1695 and the family was forced by mounting debts to sell the estate to a cousin, William Montgomery. The present house, one of the finest Georgian country houses in Ireland, was built in 1762. The atmospheric ruins of Grey Abbey itself, built by Anglo-Norman John de Courcy in 1193, are also part of the estate and contain many fascinating Montgomery memorials. Grey Abbey was burned to the ground by Sir Brian O’Neill, whose grandson Con was forced to grant two thirds of the O’Neill’s land to Sir Hugh Montgomery and Sir James Hamilton, the co-founding founders of the Ulster-Scots. Even so, when Sir Hugh Montgomery arrived in 1606 it was one of the few ruins left standing in the area. The nave of the church was converted for Protestant worship in 1626, the year Montgomery established his chaplain, David McGill, as the curate there. Alexander Byers, one of the historic characters of the novel about the 1798 Rebellion, Betsy Gray or Hearts of Down, is buried in the graveyard here. She was born at her family’s ancestral home in Greyabbey, County Down, Northern Ireland, and educated at Rockport School and Downe House, daughter of William Howard Clive Montgomery of Rosemount House and of Greyabbey, and second wife (m. 4 December 1965) Daphne Bridgeman (b. 9 April 1940). Her older brother and sisters are Hugh Geoffrey Clive Montgomery (b. 27 September 1966, m. Dunkeld Cathedral, Dunkeld, Perthshire, 5 September 2009 Laura Campbell), Rose Evelyn Montgomery (b. 26 May 1968) and Frances Mary Montgomery (b. 29 May 1970, m. 3 September 1994 Mark Henry Leo Adams, b. 8 May 1966, educated at Eton College, Windsor, Berkshire, and graduated from Corpus Christi College, University of Cambridge, Cambridge, Cambridgeshire, with a Master of Arts (MA) degree). Her maternal grandfather was Geoffrey Bridgeman. She is a descendant of Ulster-Scottish Laird Hugh Montgomery, 1st Viscount Montgomery. Flora Montgomery studied drama at The Gaiety School of Acting in Dublin, Ireland. She graduated in 1994. In 2003, she was named as one of European film’s Shooting Stars by European Film Promotion. Her notable TV appearances include The Bill as Emma, Urban Gothic, Pulling Moves and Midsomer Murders. She also acted in the 2001 film The Discovery of Heaven and in 2006 in Basic Instinct 2. Montgomery also appeared on an episode of the medical series “Body Story 2” in 2001. In the episode, she played a woman named Phoebe Hamilton. The episode showed what happened to her character’s body in response to a wasp sting. Who lived in Ards and north Down before the Ulster Scots migrated to Ireland? Many of the towns and villages in the Ards and north Down areas existed before the arrival of the lowland Ulster Scots migrants. Over the centuries, waves of people – local Gaelic Irish, early Christians and monks, Viking invaders and Anglo-Norma lords – have all left traces on our landscape. The dominant families in the area had been the Anglo-Norman Savages and Gaelic Clandeboye O’Neills. The rapid development of the Ards and north Down was due to certain Ulster-Scots gentlemen, namely James Hamilton, Hugh Montgomery and their Scottish tenants, known as “The Founding Fathers of the Ulster-Scots.” They arrived in May 1606, and these Ulster Scots settlers, Hamilton and Montgomery acquired two thirds of the huge O’Neill estates; one third was given to Hugh Montgomery by the O’Neills as a reward for freeing Con O’Neill from jail in Carrickfergus and for securing him a Royal pardon from Montgomery’s friend the new King James I. James Hamilton, friend of the King used his influence to acquire one third of the O’Neill estate. These new Ulster Scots settlers arrived several years before the Plantation of Ulster occured. 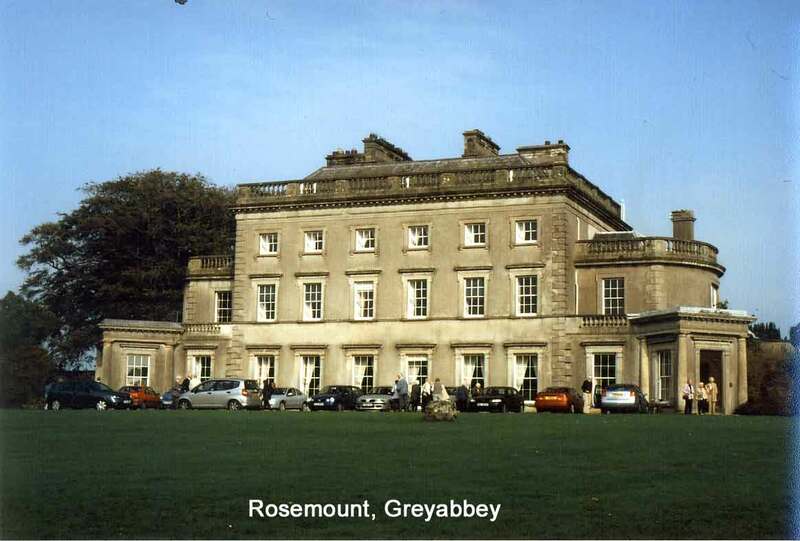 Rosemount near Greyabbey is the home of Mr Bill Montgomery and his wife and family. His ancestor, Sir Roger de Montgomeri, came from Normandy to Britain with his cousin William the Conqueror in 1066. He was given land in the Welsh Marches. The County and town of Montgomery bear his name. The family later moved to Scotland and many of the Irish Montgomerys are descendants of the Scottish settlers. Hugh was the son of the Laird of Braidstane. He became a teacher and an agent in Dublin for James VI of Scotland. He planned Con O’Neill’s escape from Carrickfergus Gaol and secured Con’s pardon. His reward was to be half of Con’s land but another Scottish supporter of James – James Hamilton – intervened so the land was divided between the three of them. Montgomery founded Newtownards, restored the Priory and built the Market Cross. He established the sea route between Donaghadee and Portpatrick in Scotland. Montgomery became a Member of Parliament (MP) and was made Viscount Montgomery of the Great Ardes. His second son, James, settled at Rosemount in 1629 and built the first house there. It was burned by native Irish in 1648. A new house was started immediately. Some stones from the ruined Abbey were used in its construction. It was burned accidentally in 1758 and the third, and present, house was started soon afterwards. Since then it has been altered in several ways. The entrance hall was changed when the driveway was relocated. In the 1840s a Hugh Montgomery married a Miss Herbert from the Welsh Marches. She had the roof raised to allow the addition of extra bedrooms for her eight children. The dining room was altered in the 1820s by the architect Vitruvius Morrison. A century later the intellectual wife of General William Montgomery added a small block at the back for a bathroom to enable the men to change after hunting. The rooms at the back have a good view over the ha-ha to the ruins of the Abbey.